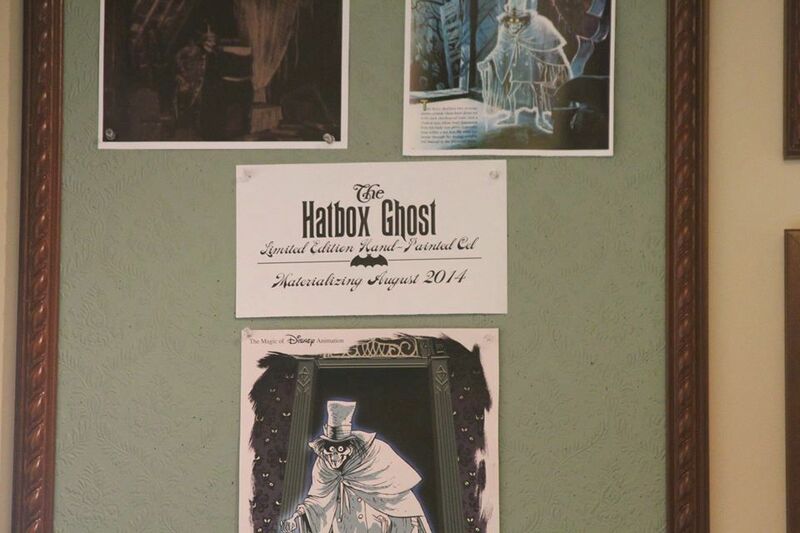 If this were the mid-1990s, an article on the Hat Box Ghost would have to spend a lot of space (1) explaining what the heck the "Hat Box Ghost" is, and (2) arguing that such a figure once existed. 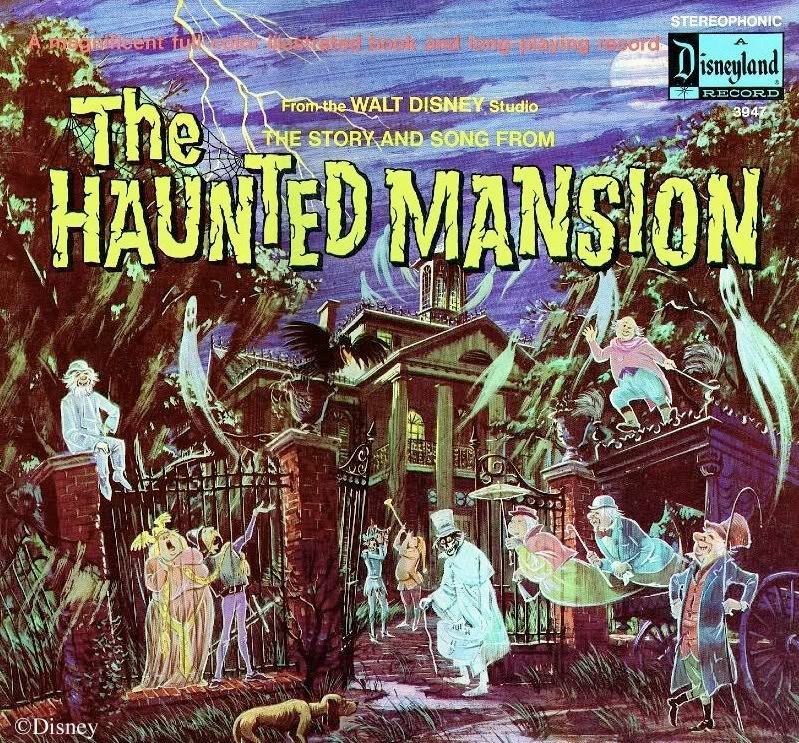 It was a classic case of a "Long-Forgotten Haunted Mansion Effect." What a difference 15 years makes—especially if a little thing that starts with "www" explodes during those 15 years. 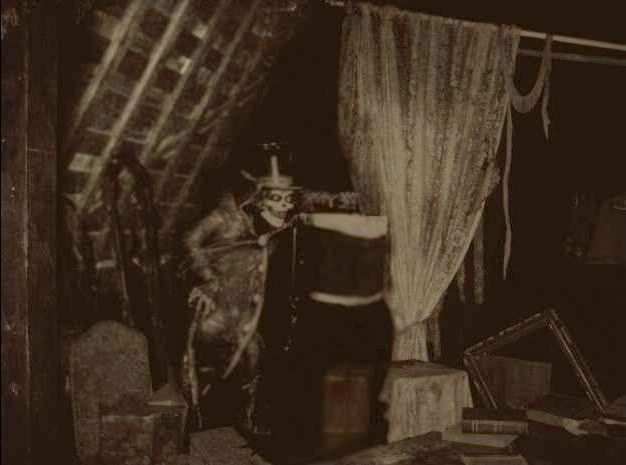 Now the problem with writing about the Hat Box Ghost is how to say something that hasn't already been said umpteen times, and how not to alienate readers who are tired of hearing about him. In some ways I can't blame them. 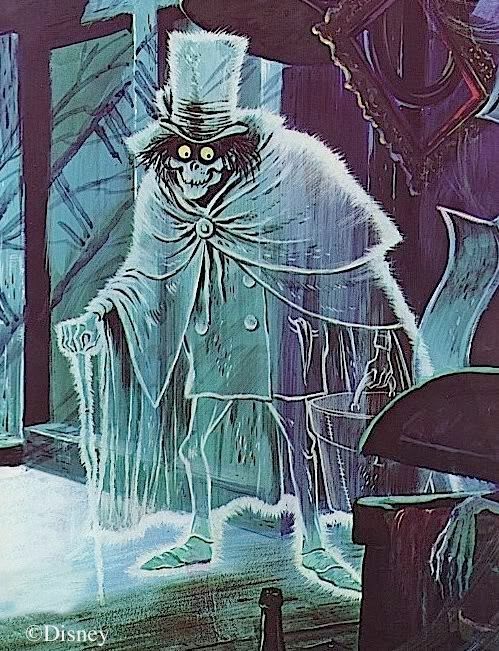 When the merchandizing arm of Disney began planning how best to celebrate the Haunted Mansion's 40th anniversary (and how best to soak the fans for every spare nickel), they decided to make the HBG their main mascot and plastered his visage all over the place: HBG on posters, HBG on online announcements, HBG pins, computer-animated HBG hosting the Haunted Holidays website—you couldn't escape the HBG's evil grin if you paid any attention to the HM 40th at all. Frankly, I couldn't wait for it to be over and gone. This photo simultaneously explodes two myths. It proves that he did exist and was installed in the ride, and it proves that the general public did see him. This shot is taken from a doombuggy. It is highly unlikely that Cast Members were allowed to take flash photos during their pre-opening preview (the "soft opening") or that one of them would have foolishly risked his/her job by trying to take one on the sly. This is not a professional photo either. Just about the only thing it can be is a tourist snapshot. 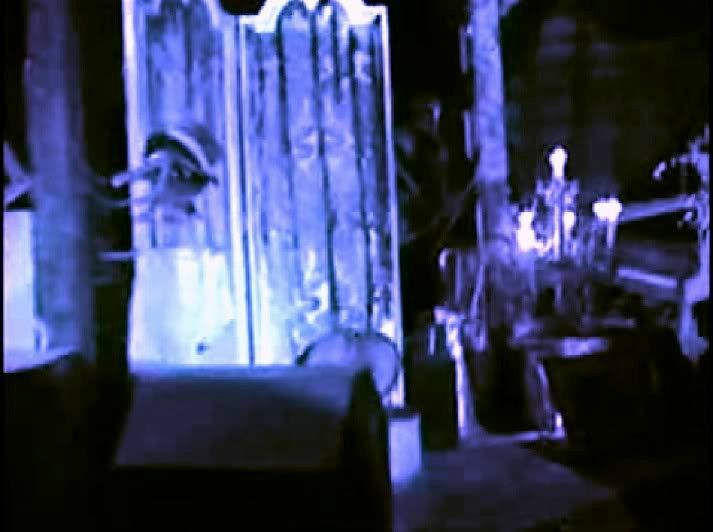 Any remaining doubt, however, was obliterated forever in July of 2011, when some amazing home movie footage was posted at Disney History Institute It includes actual film of the Hat Box Ghost taken in August 1969. I'll be danged. 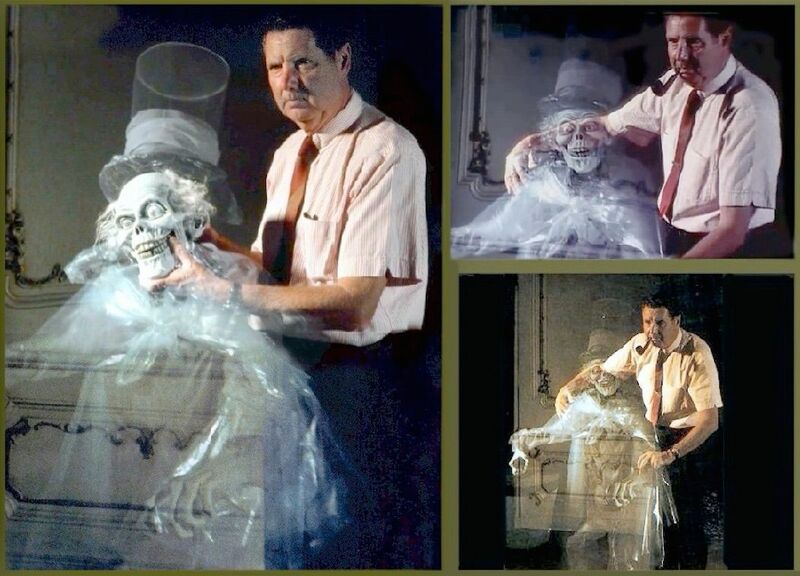 The original Hatbox Ghost in 3D. Who'da thought we'd ever see that? Well, what can I say here that hasn't been said everywhere else? How about a couple of eyewitness testimonies? Here's my lovely little tale, something I've recounted many times. If you've heard this one before, let it scroll, baby, scroll. Our family had our usual annual DL trip during the first week of August, 1969. On the Jungle Cruise, between Trader Sam and the dock, the skipper asked us if anyone knew what was happening this weekend. Nope. In a basso profundo, he told us that the Haunted Mansion was opening, wisecracking that as usual Disney only took ten years to build a ride. My brother and I went from ecstasy to despair in the course of about three seconds. We had been waiting it seemed like forever for that old house to open its gates. Now we had barely missed it and would have to wait a whole year to see it. Reasonably enough, we concluded that life stank. Well, a week or so later, some business or other required us all to ride through Anaheim, and as we passed within eyesight of the park, my Dad suddenly asked my brother and me if we'd like to go in for a couple of hours (it was already late in the day). This was unheard of. Once or twice a year was about it for our family DL trips, and the visits were never close together. He knew how badly we wanted to see the haunted house, and—bless 'im—he just decided to indulge us this once. Ka-chow. Speed, I am speed. I'm racing down Main Street, swinging through Adventureland, knocking over old ladies (kidding, just kidding), and getting into the looooooooong line. I've got some great memories from that day. 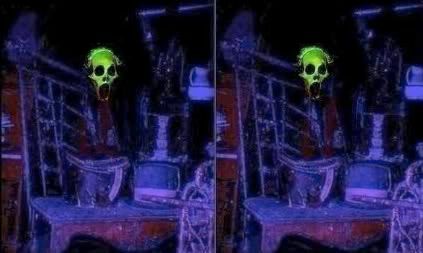 I've told you about the hitchhiking ghosts in the mirror. But in retrospect the most valuable has turned out to be my memory of seeing the Hat Box Ghost. This was August 14th, Thursday of opening week. And that was it. On our next visit several weeks later (with a church youth group—we really got lucky with DL visits that year), the weird little old man was gone, and the bride was in his spot. I figured this was a temporary situation, that something was wrong with the little guy. Even at the age of 14, I knew that figures disappeared from rides now and then for repairs, but they always came back. For a long, long time—far longer than seems rational—I always looked for him whenever we visited DL, thinking he might be back. Not until 2002 and the discovery of Doombuggies.com did I learn enough about what had come to be called "The Hat Box Ghost" to know that he had never really come back. In conversation with the one other trustworthy eyewitness that I've found (a guy who went on to work with Marc Davis for some 14 years, incidentally), more details emerged. He visited the park often in those early days. He tells me that the first time he saw the HBG his face did indeed disappear and flash into the hat box, but the next time the effect didn't work right: the face was continually lit, but the hatbox face continued to flash on and off. (This is what I remember.) Another time the face was completely blackened while the hatbox continued to flash away. He says that later on, at least once, they moved the bride out of his spot and tried the figure yet again. Now, these are the recollections of one person from when he was 11 years old, so the usual precautions about the deceptiveness of memory apply, but the account is inherently plausible, and together with other testimonies, a tentative history can be patched together. The HBG was definitely there for the "soft opening" and seen by Cast Members August 7—8. It was noticed immediately that the effect didn't work very well (catching problems is one of the reasons they have CM "soft openings," after all). They pulled him out before the HM opened to the public the next day, Saturday the 9th, but he was already re-installed by the 10th. 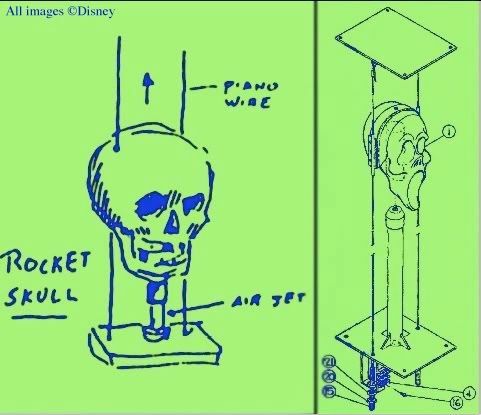 Thanks to maintenance records discovered by Tony Baxter in 2013, we know that the figure was certainly in use for at least a couple of weeks. They tried to get the effect to work. After removing and reinstalling the figure—perhaps several times—they finally gave up and permanently removed him. 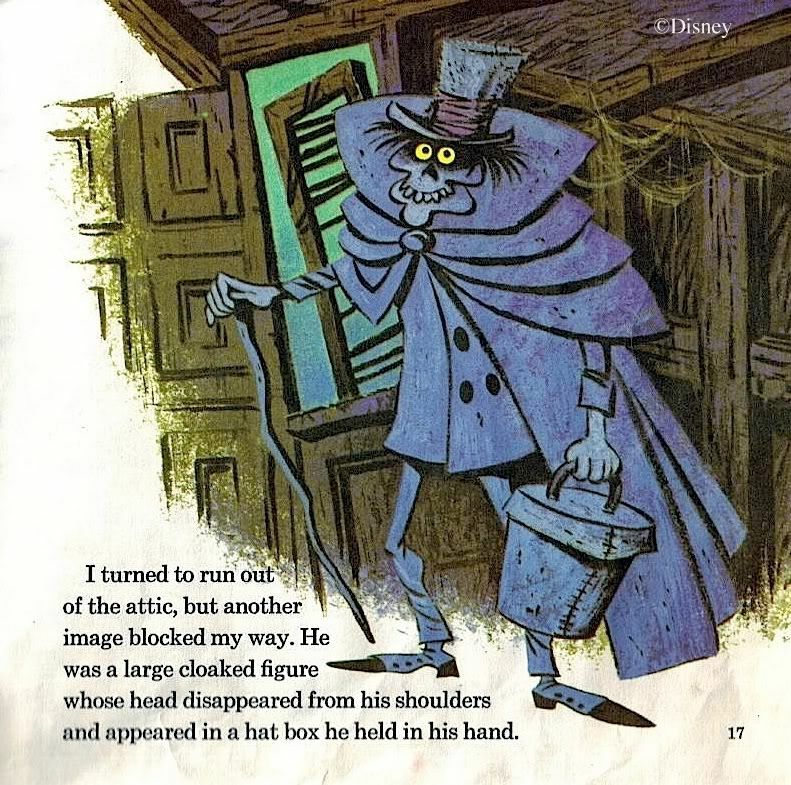 This explains why some early riders, even opening-day riders, have no recollection of the figure, and the false notion that he was never seen by the public became such common currency that it wound up in the first edition of Jason Surrell's generally reliable book, The Haunted Mansion: From the Magic Kingdom to the Movies (2003). Significantly, in the second edition (2009), this denial has been watered down to an admission that maybe the public saw him. What was the problem? 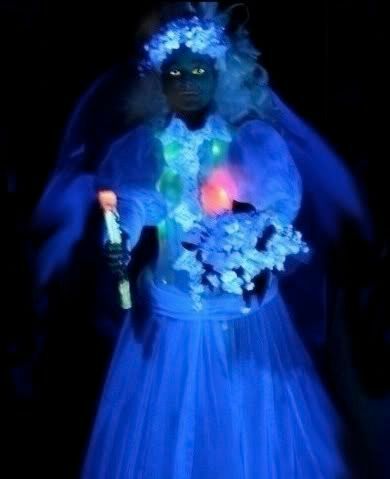 The face was probably painted with special ultraviolet-sensitive paint, which is not identical to the typical fluorescent paint that glows under a black light. It was supposed to disappear when the focused ultraviolet spotlight on it was turned off. The problem was that there was too much ambient light in the attic for the face to fully disappear on a figure so close to the track, and the illusion was unconvincing. After he was removed, the bride was shifted to his spot so that the attic would still have a climax of sorts, and that was that. 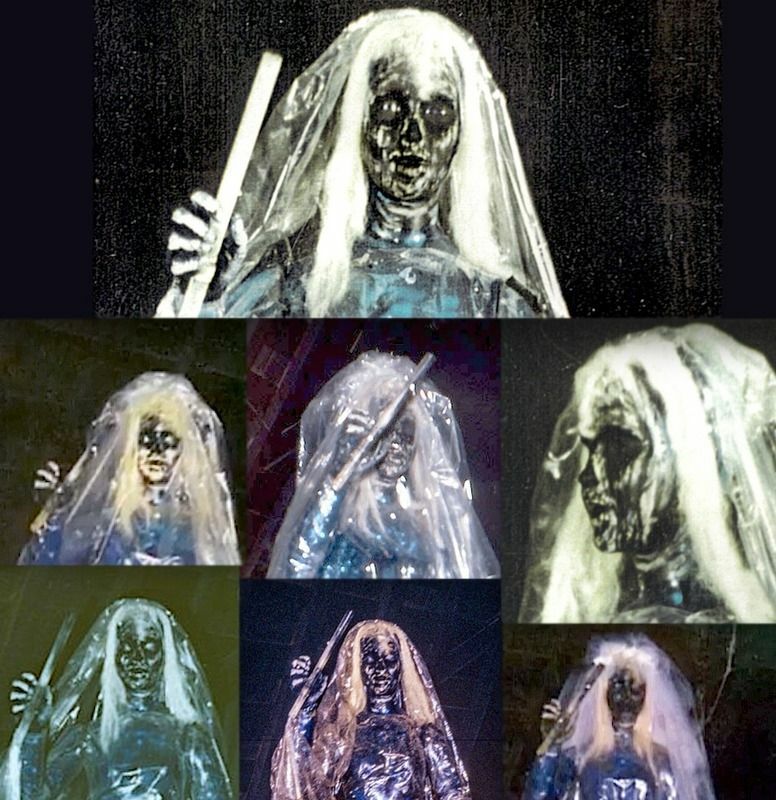 The other thing that kept the HBG flame lit was Disney's use and reuse of publicity shots for the HM featuring the HBG. 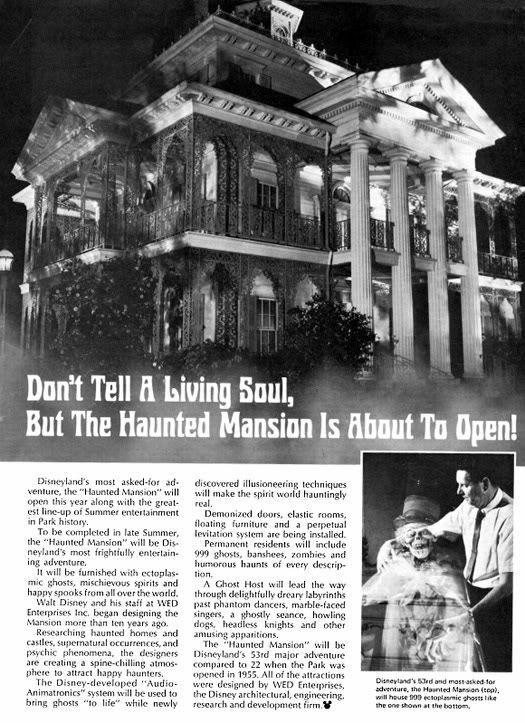 It seems that sometime in the latter part of 1968 Disney decided they would need some eye-catching promotional photos to include with press releases about the soon-to-be-opened Haunted Mansion. 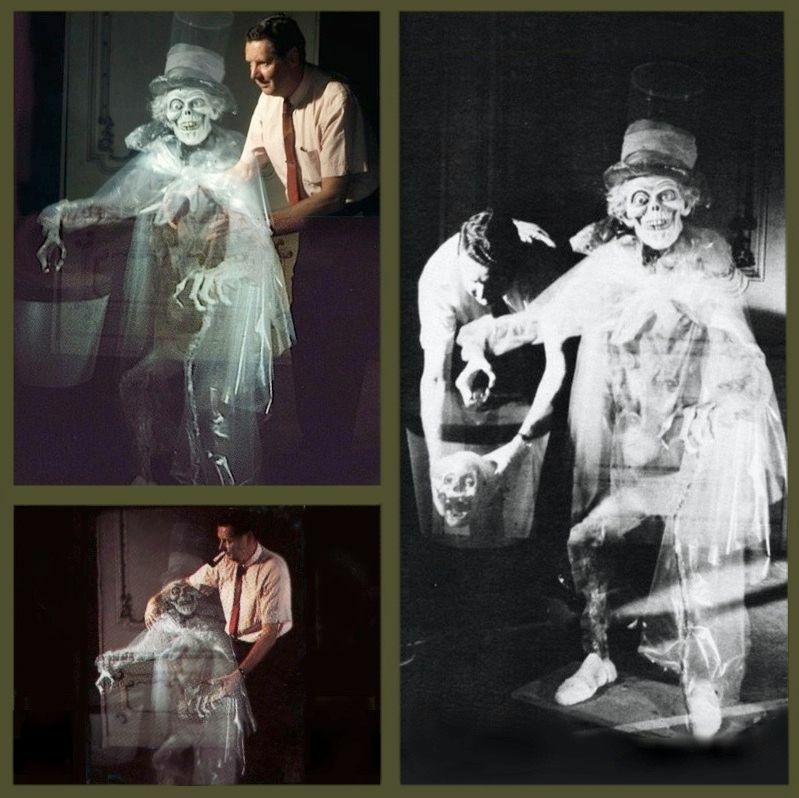 Special effects whiz Yale Gracey was recruited, and he struck a series of whimsical poses with HM ghosts, most of them reflected cleverly in a sheet of glass (the old "Pepper's Ghost" trick) or double-exposed. There were a lot of these, giving newspapers a wide assortment from which to choose. Not only that, but numerous poses from the same photo session were usually released, giving the papers even more choices within choices. As it turned out, the most popular shot was Yale posing with a HBG prototype (not the actual figure). At least eight different pictures from that particular photo shoot found their way into various publications. Disney also used these photos in their own publications, naturally. Naturally, anyone familiar with the record albums recognized the HBG immediately and was set to wondering whether it had, in fact, existed. Look Fred! There it is in a photo! (Incidentally, I think that what Yale is holding in his hands is an early prototype for the organ banshees.) 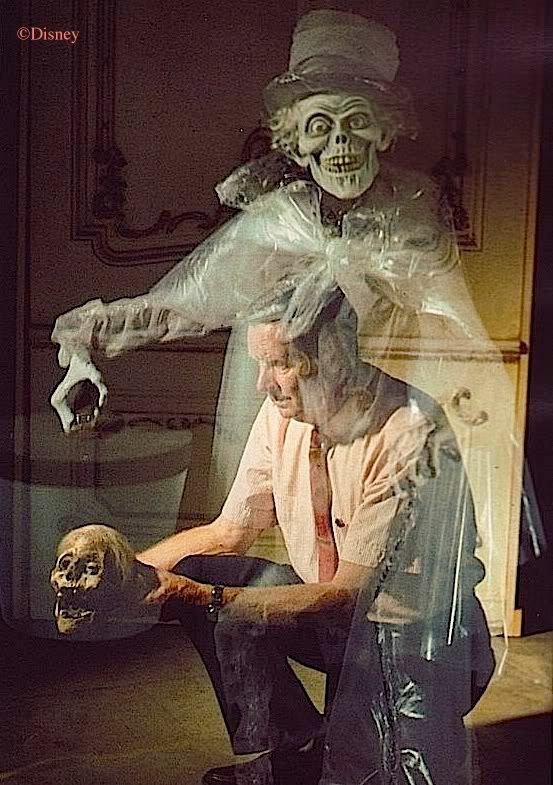 Thanks to this misleading photo, and perhaps others in the series, some people (including Tony Baxter at one point) concluded that the HBG effect was accomplished through the use of a Pepper's Ghost illusion. So you've got the souvenir record albums and you've got the Yale and HBG photos. Last but not least, there was a groundbreaking article about the HBG in E-Ticket magazine #32 (Fall 1999), including never-before-seen photos of the actual figure. 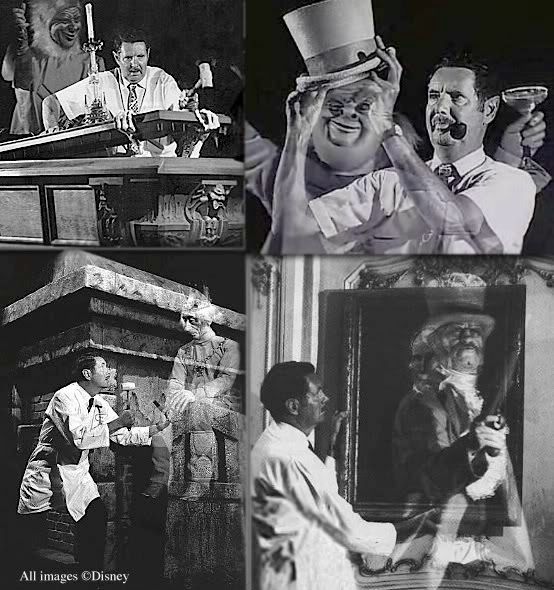 Imagineer Chris Merritt, a long-time HBG aficionado, can be credited with exhuming most of this new material from long-forgotten files in the WED/WDI archives. In turn, Jeff Baham and Doombuggies.com gave the Merritt/E-Ticket material wide exposure, recapping it for the Internet-savvy HM fan and adding a few new tidbits as well. You often hear another detail that is supposed to deepen the mystery: All the original molds for the figure have disappeared without a trace! This claim may have been true when Tony Baxter first made it, but it's been false now for years. 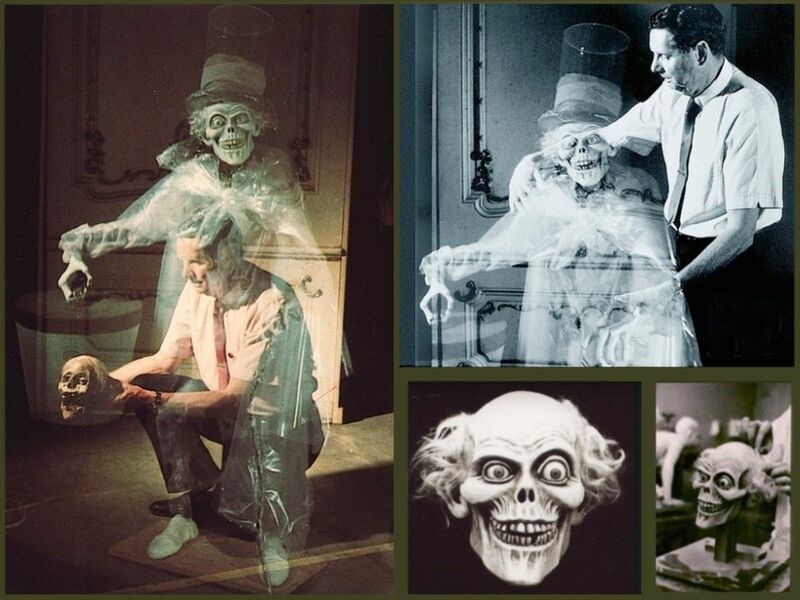 The original mold for the head was located and used in the creation of the new Hatbox Ghost (May 2015), and the mold is labeled "hatbox figure." Other than the head, there were never any exclusive molds to be lost. His hands are identical to the hands on the guy trying to open his coffin. His hat is the same thing the coachman and the picnic guy in the graveyard scene originally wore. There are no other molded parts to the figure, just aluminum tubing, wire, costuming, and wads of plastic wrap. Put it all together, friends, and it's no mystery why a sort of Hat Box mystique began to develop. He was the ghost of a ghost, leaving an ongoing sense of his absence in the attic. He was a palpable presence there, made real only by memory. A mystery. An enigma. The perfect place for a ghost, living his unlife somewhere between your imagination and the solid walls of the Mansion. Best ghost in the house, some would say, because he's there but you never see him. Hey, who am I to disagree? I came up with a photoshop to try to give some inkling of what he looked like, and now even that stupid picture has been sucked into the vortex of HBG misinformation. 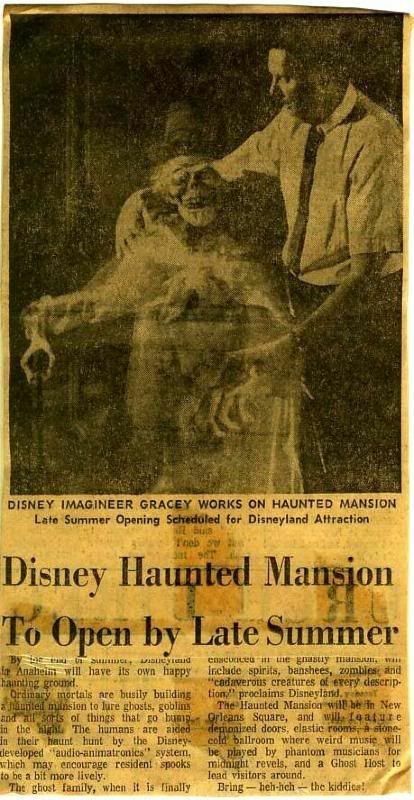 It has been taken as genuine by many people—including Disney, who used it at their Haunted Holidays website! This thing was even included in a display at the Disney Gallery on Main Street in Disneyland, in July 2014! Oboy, this is the good part. Shut up, it is too. We have already remarked in earlier posts how the HM gags had to be instantly recognizable, jokes you could "get" in a split second. We saw how the Mummy tableau in the graveyard represented a rare failure in this regard. What about the HBG? What's the background there? 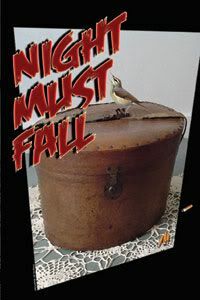 The main contributer among all these is probably Night Must Fall, which was first a play, then a film, then a radio adaptation, then a film remake. 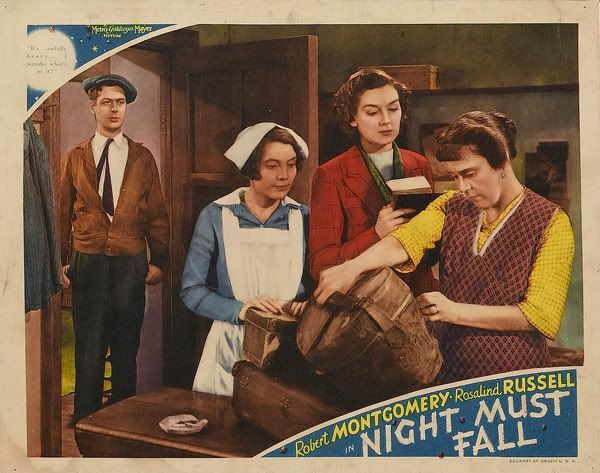 The stage version is still performed, and the films were international hits. 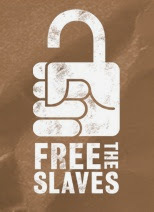 Still, I have to wonder how those relatively modest sources created such a universally recognized symbol. I almost want to go rummaging around in Freudian or Jungian categories, but I won't. Let's go back into the attic; that's creepy enough. 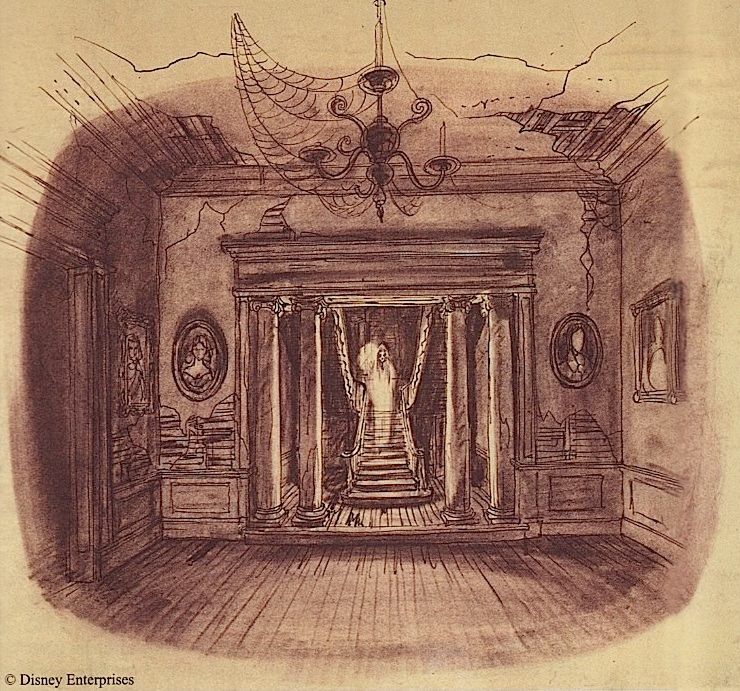 The original attic in DL's Haunted Mansion was a LOT more coherent and thematically sophisticated than it is given credit for. 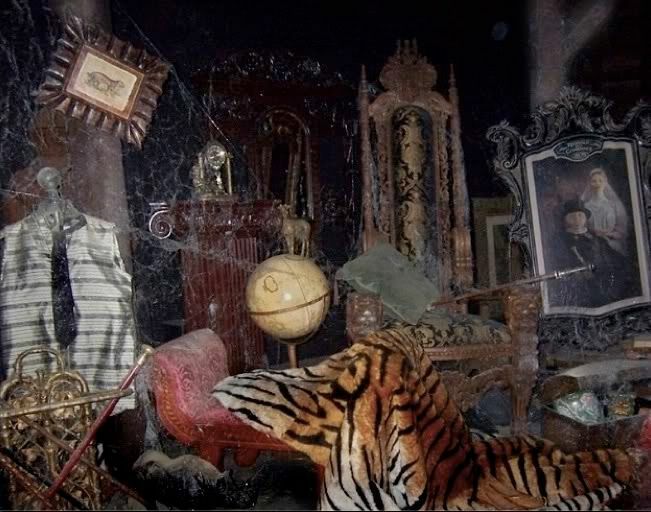 It's not uncommon for fans to point to the two major overhauls of the room as proof that the Imagineers were never satisfied with it, that it was the weakest room in the HM, etc., etc. You go a little further, and just in case you missed it the first time, there it is again, this time on the left: a skull-like head jumping out of a round hatbox. Practically right behind that second blast-up stands the original bride in her original spot. (That standing screen wasn't there in the old days.) Her heartbeat fills the room, so her presence fills the room. Is she dangerous or just sort of sad? The attic also has three regular ol' head-on-a-stick pop-ups. They're probably a tribute to traditional spook houses, like everyone says, but they also add a touch of...I don't know...menace...to the atmosphere. Finally, you see the climax of the scene: the Hat Box Ghost. Holy crap, now you know what was being foreshadowed. It's the groom! Apparently, the Imagineers assumed from the beginning that you would assume—and correctly so—that this is the groom to the bride. How did he get beheaded, and how came his head to be hidden in a hatbox? The ride only gives you one real suspect to contemplate, and of course that's the bride. Remember, her presence fills the room, and the hat box head is hideously-mockingly flipping back and forth in synch with her heartbeat. You leave the attic full of dark suspicions. A grisly crime, a shadowy suspect, a perverse nuptial. Clues to something, but only clues. 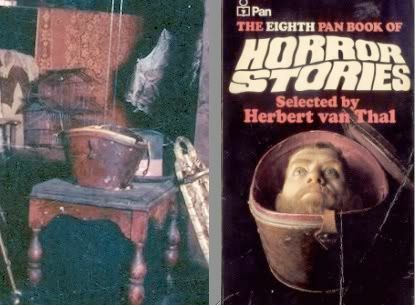 The severed-head-in-a-hatbox motif dominated the original attic, and it worked because it is an instantly recognizable visual cliché drawn from the vast pop-cultural milieu of horror, crime, and mystery. Removing the Hat Box Ghost removed the linchpin of the entire presentation, taking away the unifying climax. 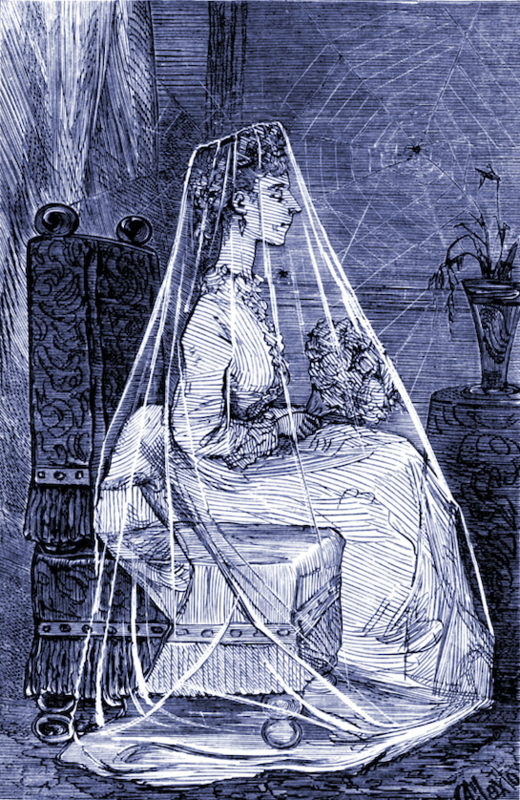 It left the bride without any connection to the blast-up ghosts, and it left the blast-up ghosts without anything to distinguish them from the other pop-ups. The overhauls of 1995 and 2006 were essentially attempts to repair the artistic damage that was done mere weeks after the Mansion opened in 1969. He even built one like that. You can barely see the top of it in this photo of Yale in his workshop. It's at the bottom in the extreme foreground. 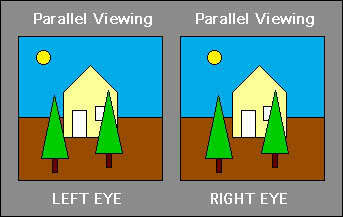 If you can "magic eye" it, it's much easier to see. (I'm telling you kids, it's a skill worth acquiring). 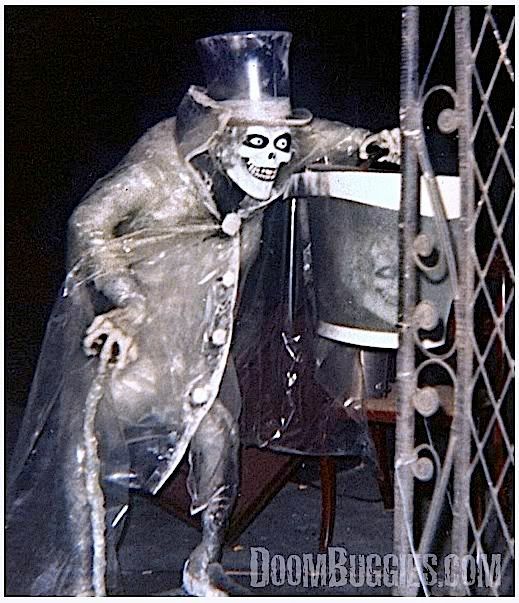 If that isn't a "rocket skull" in a leather hatbox, then it has something to do with the Hat Box Ghost himself, I'll bet. I suppose I could take that further, but I'll quit while I'm a head. If you're paying attention, you might have noticed how little the attic of today has departed from the original, thematically. Next up, when we start taking a look at Constance, we'll see how closely related the old and the new attics are. especially in the lower part of the face, so the transition to this model was less dramatic a change. For many, including your blog administrator, this is still the classic bride. She's scary precisely because she is ambiguous. Is she evil and threatening? Or is she forlorn and tragic? Is she gonna get you or is she going to plead with you for help? The candle suggests a searching figure, which in turn suggests victimhood. Bad guys don't search around with candles; they LIKE it dark (see John 3:20). But I dunno, Beating Heart still gives you the creeps. Indeed, she's the number one suspect in the murder of the Hat Box Ghost, but since he's gone, she's what the FBI calls a "person of interest." Some time in the early 90's, the Imagineers decided to beef up the attic scene (unnecessarily, in my book). They gave the bride a visible face, put in a phantom piano player plunking out a distorted wedding march, and re-dressed the pop-up ghosts as groomsmen, each of them shouting "I do" in a mocking sort of way. That "middle bride" version of BH debuted in September of 1995. This widely-reproduced photograph makes her look kind of sweet. 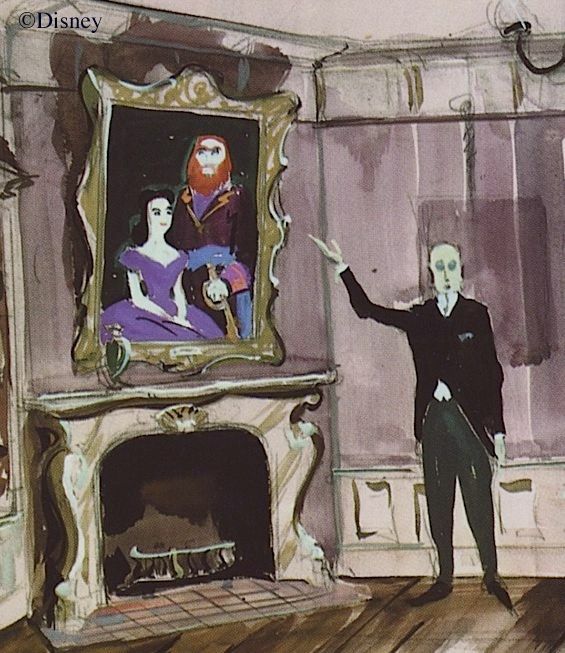 we are to the Marc Davis sketch showing a darkened upper face on the candle bearer. But it remains true that she looks more forlorn than threatening, especially with those mean old goblin groomsmen all around her, mocking her. 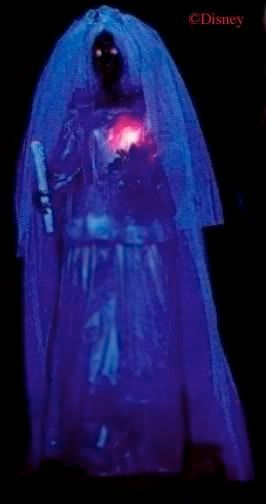 Sometime around 2000, it seems the Imagineers wanted to bring back a little more of the ambiguity that made Ol' Round Eyes scary (or at least scarier), so they made BH's eyes more like the blank old ones, and they put her veil down in front of her face. The results were impressive. These shots by professional photogs make it easy to compare "middle bride 1" with "middle bride 2." Definitely creepier, but still not as creepy as Ol' Round Eyes, IMO. 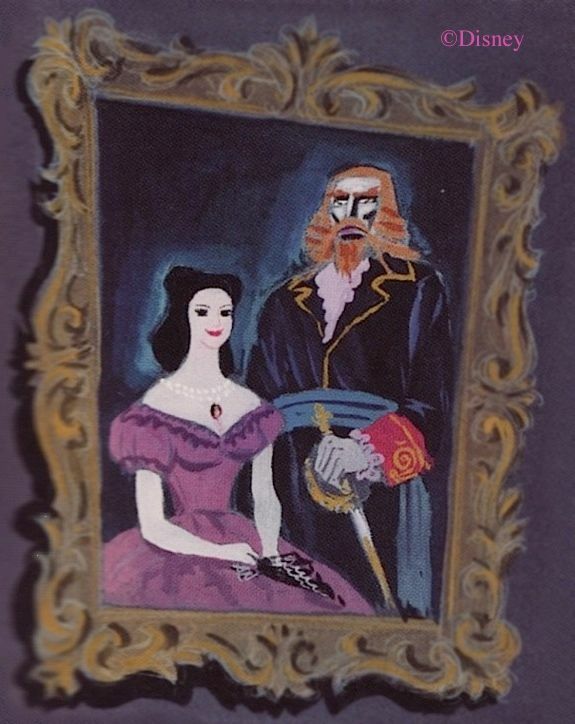 In 2006 they overhauled the attic yet again, replacing Beating Heart and the pop-up groomsmen with Constance and her grisly wedding portraits. The ambiguity is all gone; she's threatening and definitely not forlorn; plus she's something that no other version of the attic bride has ever been: comic. So now we have an absolute split between the melodramatically forlorn bride of Phantom Manor in Paris and the gleefully homicidal wacko of the stateside parks. (Tokyo retains an ambiguous form of the middle bride.) People definitely tend to take sides over Constance. You like her or you don't. Me, I dislike having a fairly full-blown story-line foisted on me, excluding me from the imaginative process and making me a spectator only. That gets boring. And that's without even considering how well the character fits into its context (meh) or how well the effect is executed (meh). I would vote to bring back Beating Heart in a heartbeat. This widely-reproduced pic is undated, but she looks a lot like the '89 model above, except veiled. Orlando went to a "middle bride" with a fully-visible face about the same time as Anaheim. The main difference was the hair, which was pretty crazy at WDW. 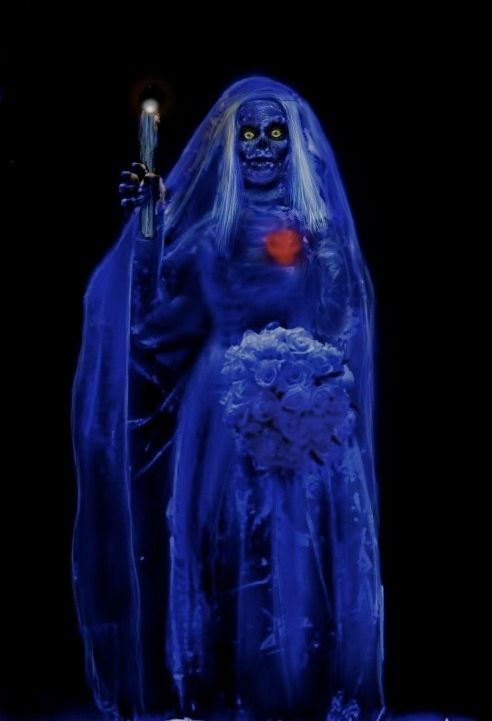 They were forever fine-tuning her face, but a lot of people never liked this version ("the smurf bride") and preferred the spookier DL middle bride. 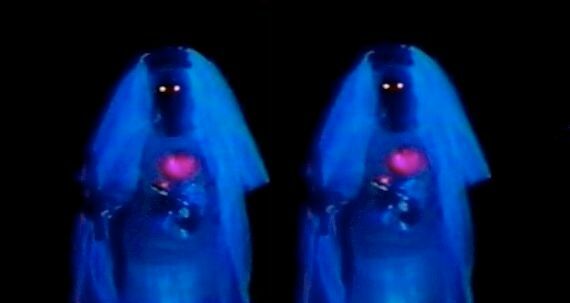 But just as was the case at DL, the middle bride doesn't look so much threatening as forlorn (yes, I realize I'm overusing that word). Still, WDW never got as melodramatic as DL did, since Florida was spared the mocking groomsmen shouting "I do." Never got those. here are two handy murals of the bride down through the years. 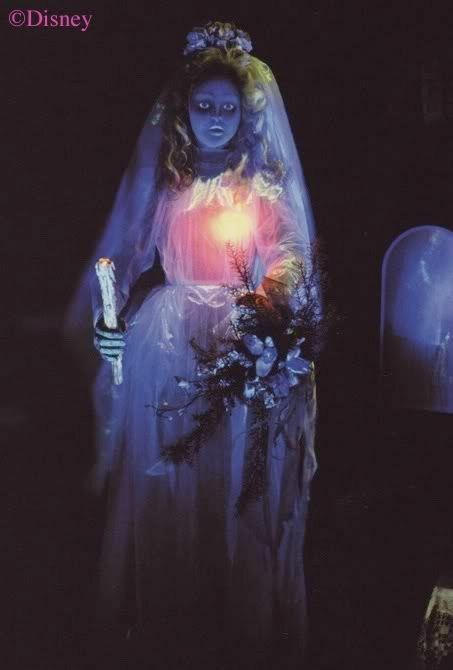 At Disneyland, the Corpse Bride version of Beating Heart was the original, lasting from Aug 1969 until the late 70's. The round-eyed, dark-faced Beating Heart replaced her and lasted until 1995. Then it's the first "middle bride" (Sept 1995—ca. 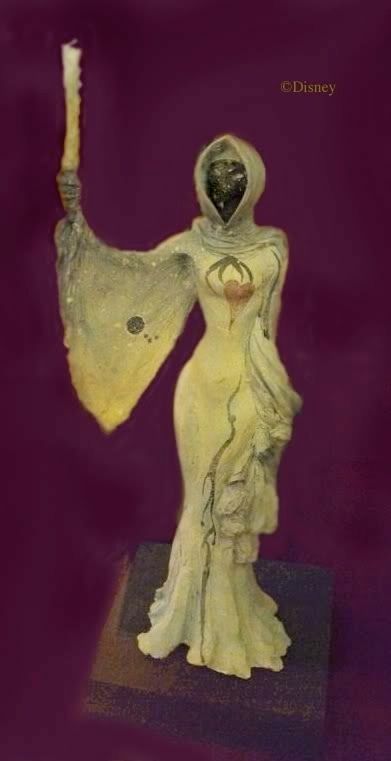 2000), the second "middle bride" (ca. 2000—May 2006), and Constance (May 2006—now). 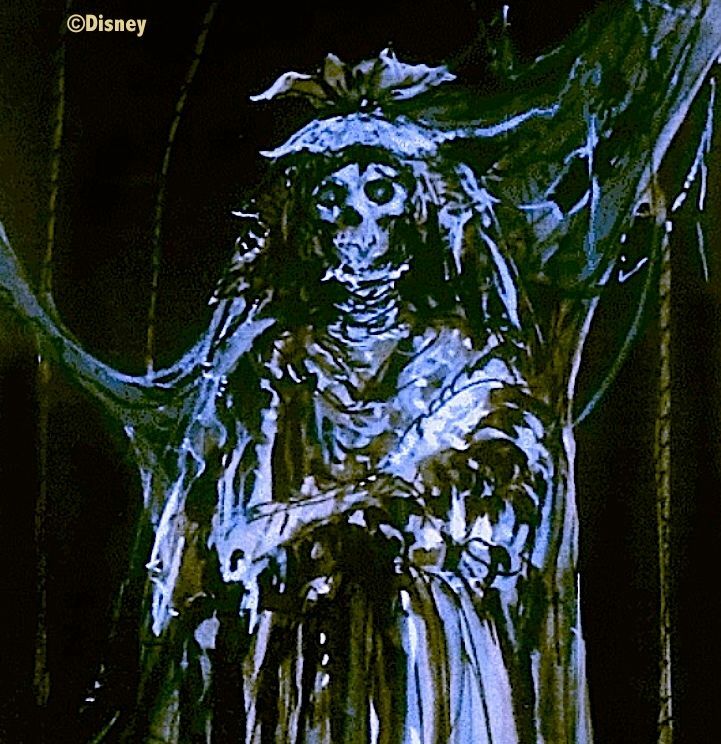 At WDW, we started out with the Corpse Bride (Oct 71—sometime in the late 70's, early 80's), followed by Ol' Round Eyes. They went to a "middle bride" about the same time DL did (ca. 1995). 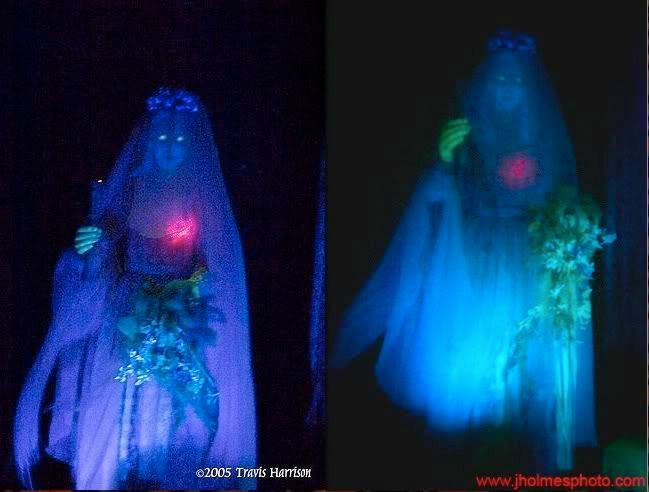 WDW continued to fiddle around with her over the years, but not as radically as DL did, and so I lump all the brides in the Orlando attic from 1995 to 2007 into one "middle bride" category. Constance debuted in the fall of 2007. That was her name, or title, I suppose you'd say. "Beating Heart." It's on all the blueprints and on the schematics for the figure herself, but somehow it never made its way into public usage. Oh well. This and the next post have been extensively rewritten several times over the years as new evidence has continued to come to light. With this topic in particular, sometimes we feel like we're barely treading water around here. The blog format proves extremely useful sometimes. In our last exciting episode, we traced BH's roots from the Brown Lady of Raynham Hall to the red-hearted candle bearer in the attic. 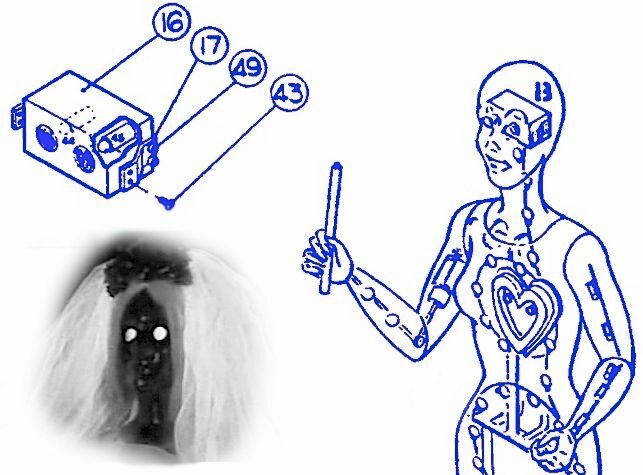 The project had proceeded to scale model phase, and still the attic ghostette wasn't clearly recognizable as a bride. This final touch to the character was probably added in 1968. The script for the "Story and Song" album refers to her as a bride, and this script in turn closely follows a '68 show script by X. Atencio. 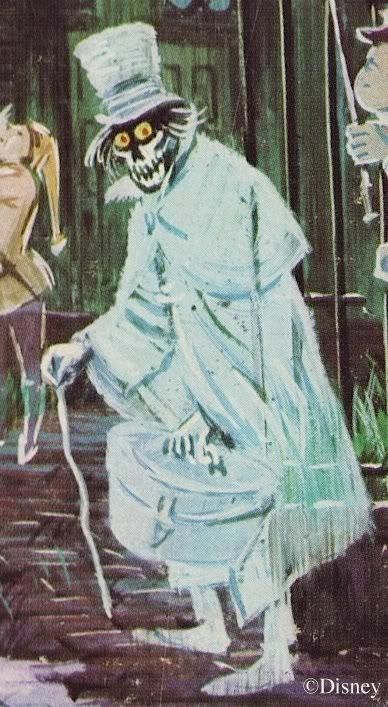 Whose idea was it to turn this ghost into a bride, anyway? Ken Anderson makes a modest contribution, early in the process. He wrote four show scripts in 1957-58 (essentially four; some of them have alternate ideas already included in them). 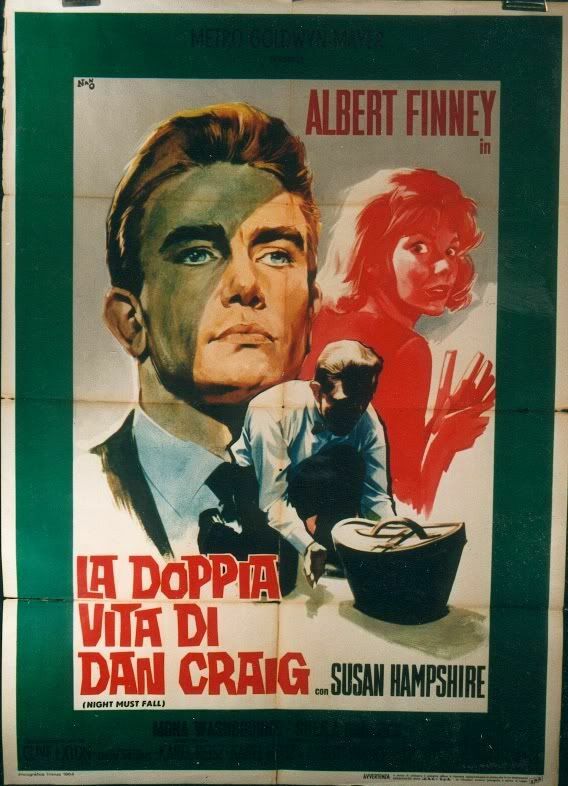 The first script in particular (Feb '57) is often cited as the beginning of our attic bride. In it, Beauregard the butler directs our attention to a painting and tells the sad story of Captain Bartholomew Gore (aka Gideon Gorelieu) and his young bride Priscilla. When Priscilla discovers the horrible truth that her husband is, in fact, a bloodthirsty pirate, he kills her. Her ghost comes back for vengeance and eventually drives Capt. Gore to suicide. Now the place is haunted. Bingo, haunted house. Okay, that seems clear. A tragic bride haunting the house, looking for revenge. Case closed. They just borrowed an old Ken Anderson idea. Well, not so fast. First of all, there's nothing associating Priscilla with the attic, and more importantly, she's a "bride" by definition b, not definition a. A bride is a woman soon to be wed or recently wed. The former wears a bridal gown; the latter wears a purple dress (or jeans, or whatevv), like our poor Priscilla. Aside from the bare fact that she exists not too far distant in time from her wedding day, Pris really has nothing in common with the familiar attic bride of the finished ride. Which one is naughty and which one is nice? I'm not telling. Anderson's other three scripts don't get us any closer to the attic bride. Two of them do organize the present day's ghostly activities around a wedding feast. In one, "Monsieur Bogeyman" is planning to marry "Mlle. Vampire," and all kinds of famous spooks and monsters are showing up (Dracula, Frankenstein, etc.). She jilts him at the altar, and things get ugly. (Truth be told, I'm very thankful that one ended up on the cutting room floor.) In another, the narrator guides you through the house toward a wedding reception. It seems the ghosts of the luckless Blood family have been trying to complete the tragically-interrupted marriage plans of one of their daughters, and sure enough, you do eventually see a ghostly wedding banquet of sorts taking place. 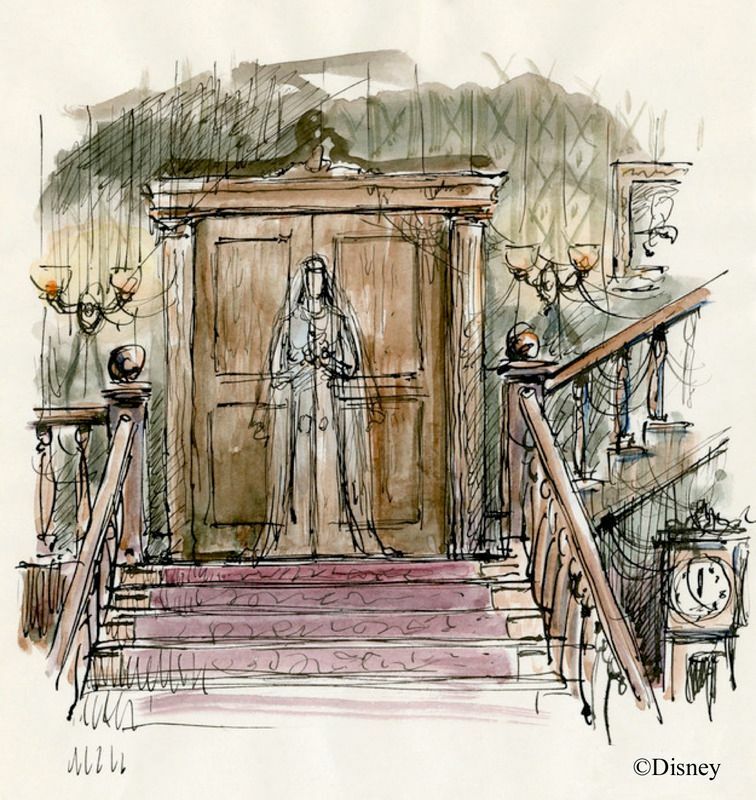 May of 2014 a never-before-seen Marc Davis sketch was published showing a ghost bride on a stairway landing. 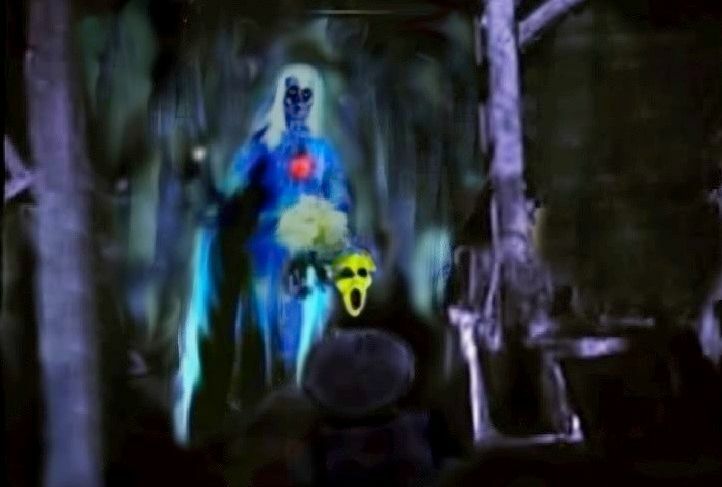 by the old Ken Anderson sketch based in turn on the Brown Lady of Raynham Hall photo. 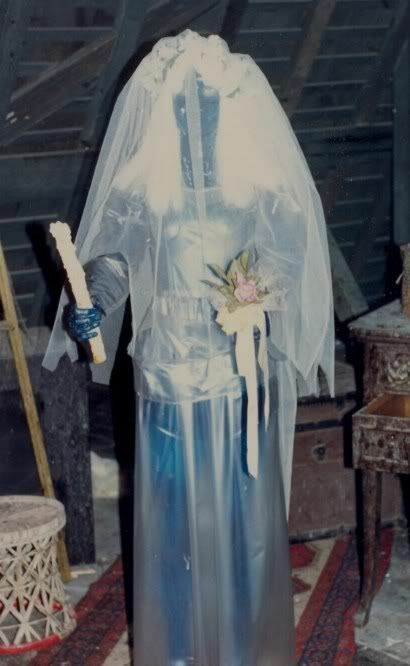 as Anderson's creepy ghost is transformed by Davis specifically into a bride. This gets us even closer to where we will eventually end up. Obviously, Davis liked the ghost bride idea, and we may speculate that one day the light bulb clicked on, and he realized that his rather fierce-looking attic ghostette would actually be a perfect vehicle for the corpse bride concept. And so it was. At last our elusive ghost has donned a wedding gown. They put Beating Heart in exactly the spot occupied by the maquette figure in the scale model; that is, on the left side, and a little ways to the left of the spot where today there is a ghostly piano (I'm talking DL, of course). For you young'uns with short memories, her heart glowed red and visibly pumped back and forth, while the sound filled the attic: Lub dub. Lub dub. That's where BH was on opening day, and that's where I remember seeing her on August 14th. New info: A large plastic sheet (called "nylon 6") was in front of her, stretched from post to post and floor to ceiling, probably with the intent of making her appearance fuzzier. That too jibes with my memory. I remember her slowly rocking back and forth in an area that reminded me of a door frame, and she was definitely murky. She was only there a month or two. 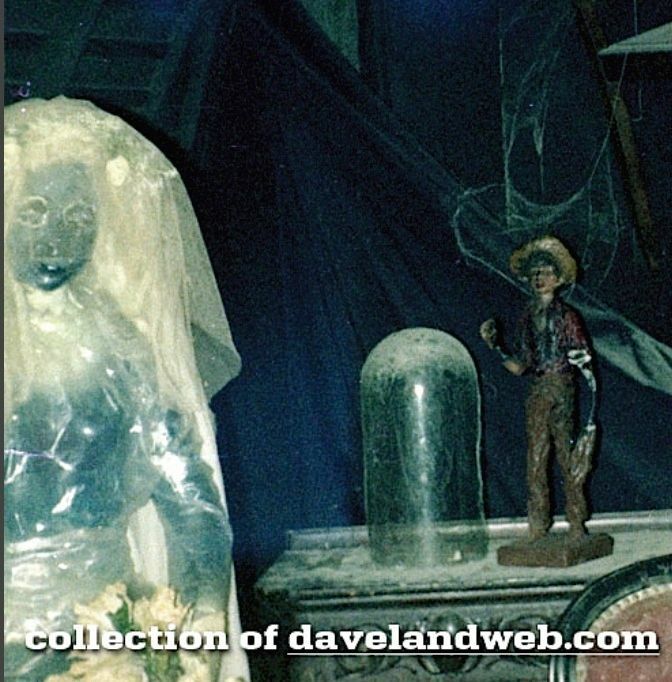 When the (infamous) Hatbox Ghost, which was located near the exit on the right, failed to perform as hoped and was removed, BH was transplanted to his old spot. There she remained from Aug-Oct 1969 until May 2006, when she jumped the track to the other side and became Constance, that zany hubby-whackin' axe murderer. However, even that is not the oldest photography of the original bride standing in place in the attic. One day in June of 2011, Disney fan and historian Todd J. Pierce was going through a box of old home movies and photos he had acquired, and there he found a small reel dated August 1969. 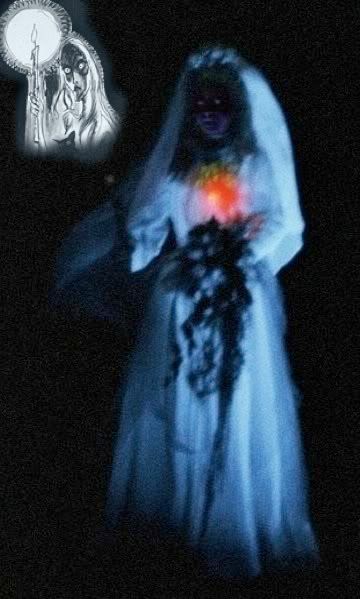 To his astonishment, this one-minute film featured a rare glimpse of the Hat Box Ghost, as well as about three seconds of murky footage of the bride, the only known photography of the original bride in her original position. An edited version of the film was posted at the Disney History Institute on July 9th. 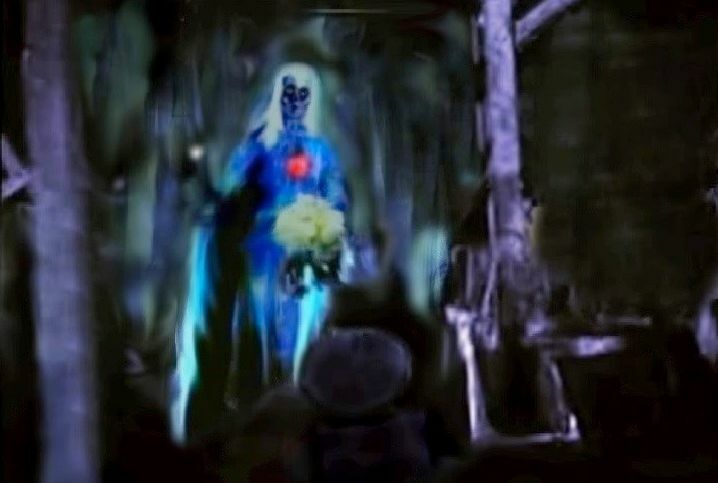 Not much of the bride is visible, but you can see the red heart, beating back and forth, the tip of her glowing candle, and a number of large white smears and smudges. Occasional details like her hair are visible only in a frame or two here and there. 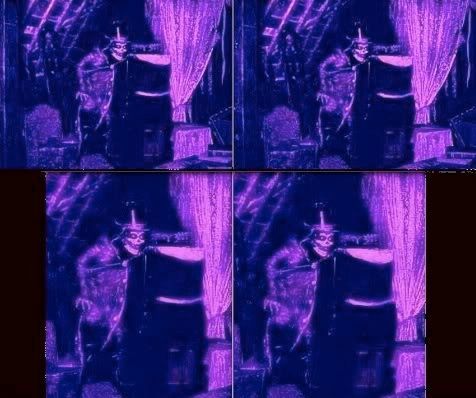 Here's a GIF with a picture of the Corpse Bride superimposed on a composite of various stills from the film. The fit is pretty exact. Exactly when the Corpse Bride was replaced is not known, neither for DL, nor for her twin at WDW. Based on what evidence I have, the latest possible date would be the late 80's. 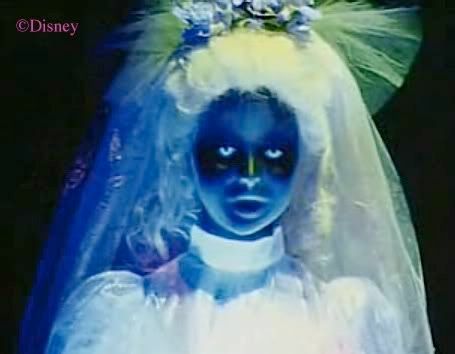 There is some evidence suggesting that the Corpse Bride was still in use at WDW in the late 70's, so "sometime in the 80's" cannot be far off. 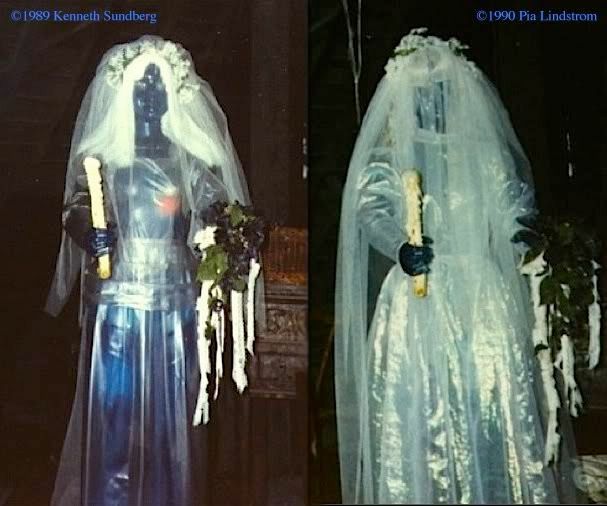 Speaking of WDW, unlike the situation with regard to Anaheim, photos of the original WDW bride are extremely rare. One surfaced in February of 2013 and showed up at the irreplaceable Daveland site. 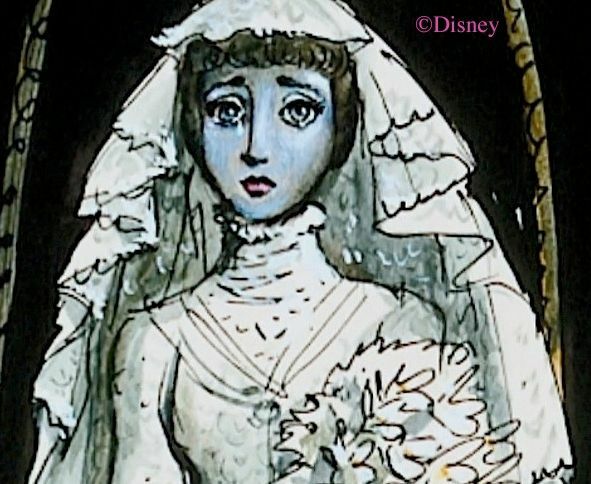 It's the Corpse Bride, all right, but her face in Orlando was never painted with the same amount of detail as the DL version, especially in the lower part of the face. original looked like, and based on available evidence I'd say it's pretty accurate. Kids, hide your eyes! Okay, fine. Not my fault if you have nightmares. Where are your parents? the photo below. It's sorta well-known, and it's often presented as the original 1969 bride. There are enough idiosyncrasies about it that at least one intelligent observer has argued that it is a pre-opening prototype and not a production figure. The most glaring problem is the slit-like eyes. No other bride photo shows anything like that. Highly suspect. Not only that, but as it happens the mechanical design of the lighted eyes would allow for any amount of manipulation of their shape. You just mask the WALL -E eye box in her head (well, that's what it reminds me of) in any way you think appropriate and get any shape eye you want. 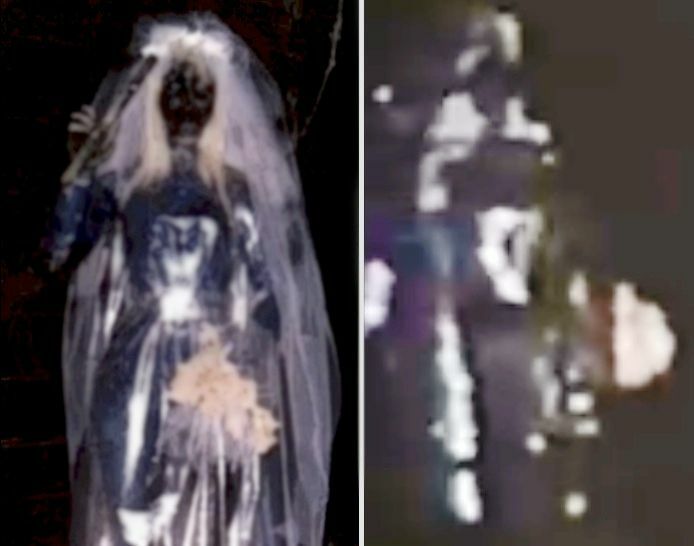 So yeah, I suppose it's theoretically possible that the slit-eyed bride was there as a short-lived experiment, but it's extremely unlikely that she was the original. Like the round-eyed, dark-faced version that eventually replaced the Corpse Bride (seen above on the left), the slit-eye version has very bright eyes. 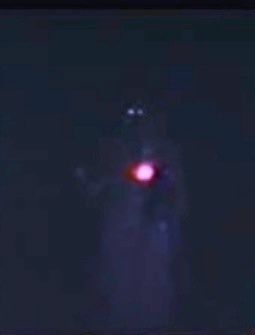 They would certainly have been visible in the August '69 film footage if she were standing there, but the eyes are only visible in one frame, and even then just barely. 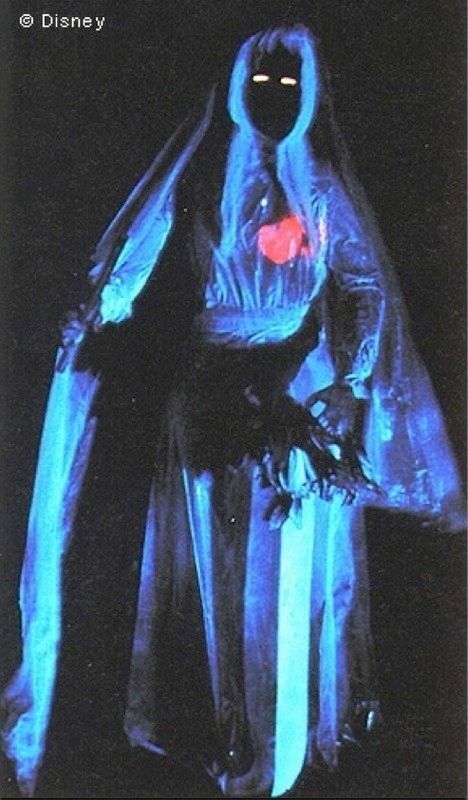 I'm pretty sure the mystery photo is either a picture of the second version of Beating Heart (with the eyes narrowed), or it's a prototype. Next up: Ol' Round Eyes and the "middle" brides.